How far would you go to live the life of your dreams? MJ Kaufman’s new play tests the limits of our hopefuls and their loved ones on the journey of a lifetime. While most of us love to take a vacation, the one thing we can always count on is the comfort of returning home to our families. 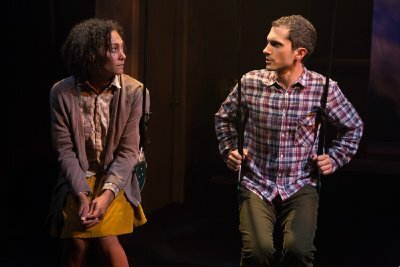 For the adventurous cast of MJ Kaufman’s How to Live on Earth, the opposite proves true, as they seek a permanent relocation to space and struggle to deal with their ordinary lives on planet Earth. Under the careful direction of Adrienne Campbell-Holt, relationships are highlighted in this production as partners and family members are affected by a life-changing possibility. Hopefuls Omar (Genesis Oliver); Bill (Charles Socarides); Eleanor (Amelia Workman) and Aggie (Molly Carden) are waiting on their applications for a once-in-a-lifetime-opportunity to leave Earth forever and be transported into space to take on a new mission. Each is exhilarated at the chance of starting over and leaving their current life behind. The group comes together as they are in the waiting room for their interviews and marvel at the possibility of change and progression, as each wants to feel accomplished. Their excitement and hopes for the future are inspiring as they prepare to make the most important decision of their lives. As they are preparing for the final selection, the audience also sees how their decision will impact their families, loved ones and significant others. Aggie’s father, Robert (Adam Harrington), has never been close to her and is not pleased with this current venture, even though he’s never seen her this passionate about anything before. All she wants is for him to admit that he cares and will miss her, which is difficult for him to express as the final decision draws closer. Superstar Bill who is a shoe-in for the program has the support of his loving mother Carol (Lynne Lipton) who is so proud of her son, even though her heart is breaking. His brother Don (also played by Oliver) who has always lived in his shadow, is left to deal with his own personal feelings of inadequacy and figure out his place in his family. Omar’s partner, Rick (also played by Harrington), also begins to imagine the emptiness of life without his rock, and Eleanor’s love interest Russ (also played by Socarides) is conflicted about continuing a relationship with a girl who may be gone forever. How to Live on Earth provides a heartwarming look at the true test of relationships. We all have dreams and desires in life, but they sometimes come at a significant price. The prospect of relocating forever forces some of these hopefuls to consider what they would be giving up and revaluate if their current life situation is really that terrible. Perhaps they will be giving up more than they will be gaining. Costume designer Ashley Rose Horton matches the personality of the cast to their wardrobe choices. Quirky t-shirts with funny sayings and images bring out the unique persona of Aggie; Horton’s other choices reflect the edgy style of a hipster reading poetry at a dive bar or the reserved look of a programmer looking to add some excitement to his monotonous day-to-day. This cast does an extraordinary job of going beyond the surface of their emotions to uncover new levels of vulnerability. Even though this process looked for the best and the brightest, these hopefuls (at their core) are human. They are scared, unsure and that honesty is beautiful to witness and helped connect them to each other and the audience for that matter, as we all struggle with the uncertainty and fear that comes with a major life decision. This story could have easily become one of strength and competition, but the formula for success here proved to be their willingness to share their authentic selves. The lighting by Grant Yeager adds to the “out-of-this-world” atmosphere with flashes becoming dimmer and brighter at the appropriate moments, matching the current mood on stage. Sound design by M.L. Dogg allows the cast to express their thoughts and emotions freely while echoing the intensity of living in another dimension. Modern technology such as Skype is featured (with bad connection and all) to mimic the challenges in communication we face every day. 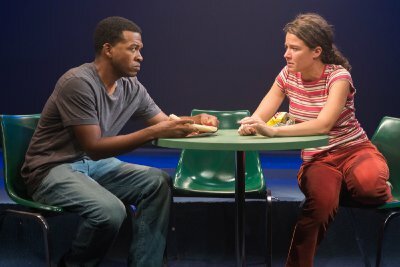 Amy Rubin’s scenic design is clean and simple, using common props such as tables and chairs to create the spaces of a waiting room, restaurant and living areas that don’t distract from the main storylines. Videos and television screens provide an extra boost that relay important information and a glimpse into life in space, without adding any additional bulk on stage. Audiences will receive a refreshing and meaningful gift in How to Live on Earth. This production sparks several of the big overarching questions, regarding the meaning of life and will also keep you chuckling throughout the 90 minutes. The mix of personalities blends really neatly together and ultimately proves that underneath it all we are all the same: human beings trying to figure out what will make us happy in this world (or the next!). Somewhere between the raindrops, Catya McMullen has written a wonderful play. Theatrical pyrotechnics abound in this stage treatment of the 1954 hostage drama film that starred Frank Sinatra as a would-be presidential assassin. This hodgepodge of meta-theatrical vignettes makes for an uneven experience. It’s brightly performed, has cool puppets and a terrific number from Hamilton. New Theresa Rebeck thriller about domestic abuse teaming siblings Tyne and Tim Daly for the first time leaves more than the violence to the audience’s imagination.